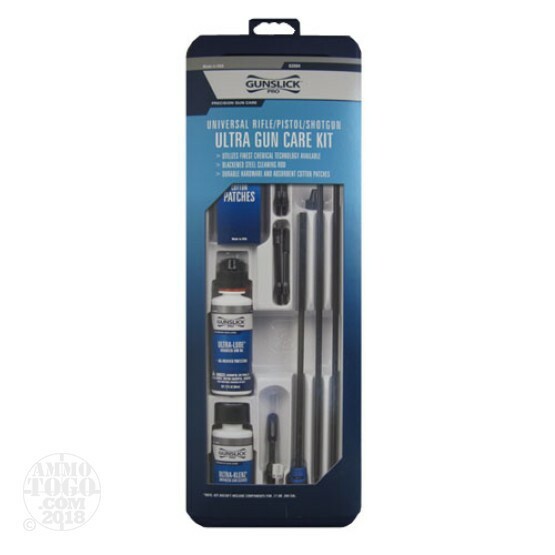 This is a Gunslick Universal Ultra Gun Care Rifle/Pistol/Shotgun Kit. This Gunslick Universal Kit contains 2 oz. Ultra-Lube; 2oz. Ultra-Klenz, blackened steel rod with “soft grip” handle, muzzle guard, 22/270 & 30 caliber jags; shotgun, 22/270 & 30 caliber slotted tips, and cotton patches. All this stores in a reusable storage box.